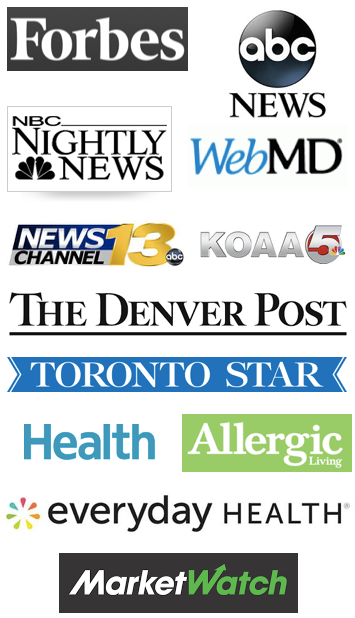 I enjoyed another FABulous conference in Denver this past weekend with many of the top food allergy bloggers and consumer advocates. 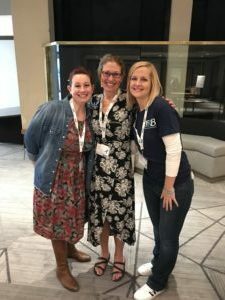 This conference was the brain child of Jenny Sprague, who continues to run the conference along with Erica Dermer and Keeley McGuire. 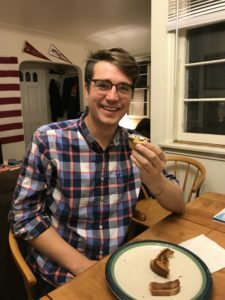 My son was diagnosed with food allergies 20 years ago…before Facebook, before the Internet, before there was a support group or any food allergy conference, and before any food labeling law. About the only thing that was around was a very kind allergist who gave me copied materials from a non-profit group called Food Allergy Network (through several name iterations, it has now become FARE – Food Allergy Research & Education). It was a lonely place, and my neighbors certainly didn’t understand what it was like to try to raise a child with food allergies. 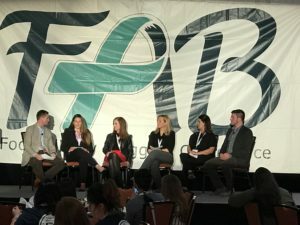 Going to the conference this weekend, I was most reminded of how grateful I am that there are so many people in the “food allergy world” now. Bloggers, parents, allergists, dietitians – all shared their experience, their knowledge, the latest research and hope. 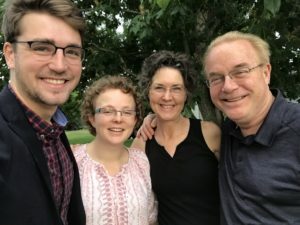 It’s not a group in which I ever aspired to be a member, but as I continue to walk the road of parenting a child – now a young adult – with food allergies, I am so thankful to be able to do so with a large group of friends. All four national food allergy advocate groups – Allergy & Asthma Network, Food Allergy Research & Education (FARE), Food Allergy & Anaphylaxis Connection Team (FAACT), Kids With Food Allergies (KFA) -along with Kaleo discussed their new initiative to address food allergy bullying called No Appetite for Bullying. Zac Chelini, a young adult with multiple food allergies, also spoke about his experience with bullying in grade school and beyond. If you’ve experienced bullying, or know someone who has, you can submit the experience on the website referenced above and help raise awareness of this very important issue. The expo at the Conference is the best I’ve ever seen. It’s so wonderful to get to sample new products and foods – many of which are top 8 allergen free or more! Enjoy Life Foods is a regular at expos and conferences, and for good reason. Their foods are free of the top 8 plus they are made without casein, potato, sesame and sulfites. 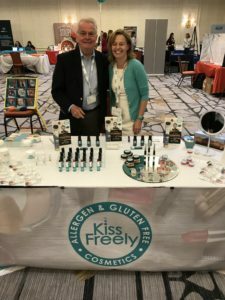 Kiss Freely is all natural, gluten and allergen free makeup, lip gloss, face paint and body cream. Their products are free of the top 8 allergens plus free of sesame, shea butter, peas, coconut, avocado and sunflower seed. I love the new body butter I discovered at their booth! 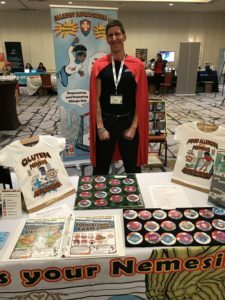 Allergy Superheroes empowers and protects allergy kids with their t-shirts, slap bracelets, buttons and Teal Pumpkins. Their focus is consistently positive and creative! 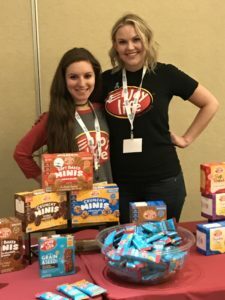 Sit By Me Bakery is a Colorado duo baking without gluten, wheat, dairy, egg, soy, peanut, tree nuts (they do use coconut*), fish, shellfish, seeds, potato, corn, yeast, artificial colors, and preservatives. They provided many of the sweets for the conference. Steve was nice enough to provide a cinnamon roll for my son, Morgan, to try. It was a hit! Morgan Smith, skipping the last of his meal, to eat a Sit By Me Cinnamon Roll! 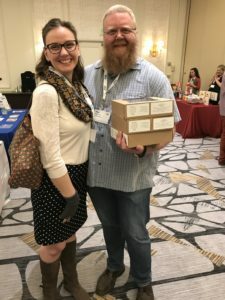 The swag bags from the expo are filled with so many wonderful new treats, that I had to stop by my son’s place in Denver to share many of the goodies! 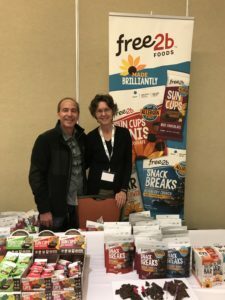 Free2b never allows peanuts, tree nuts, dairy, gluten/wheat, soy, egg, shellfish, fish, coconut, corn, mustard, or sesame in their plant or products. They are also free from artificial sweeteners, flavors, colors, sulphites, GMOs, hydrogenated oils and transfats. David continues to develop new products in an attempt to make them taste even better than their “original” counterparts. There were probably two dozen more companies and products at the expo, so these are just a sample of a few of them. If you’re in Colorado, you REALLY want to come to this conference to sample all of the exciting new products every year. For the past two years, Kaleo has been a major sponsor of the Conference. Evan Edwards is not only a founder and executive with Kaleo, he’s also a food allergy patient and parent. Which means that he’s just one of us. He participated in many of the sessions, learning about new research, and sharing his experience. It’s wonderful to have a pharmacy executive who is so down-to-earth. Kaleo has doubled in size as they continue to produce the wonderful Auvi-Q epinephrine autoinjector. 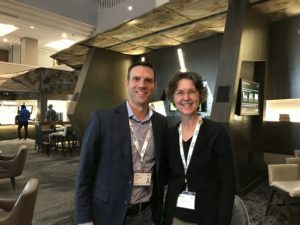 In separate blog posts, I will provide you some information that was shared about recent research and how to manage parental and child anxiety surrounding food allergies. Watch for those soon! Thank you to everyone in attendance for a wonderful weekend!